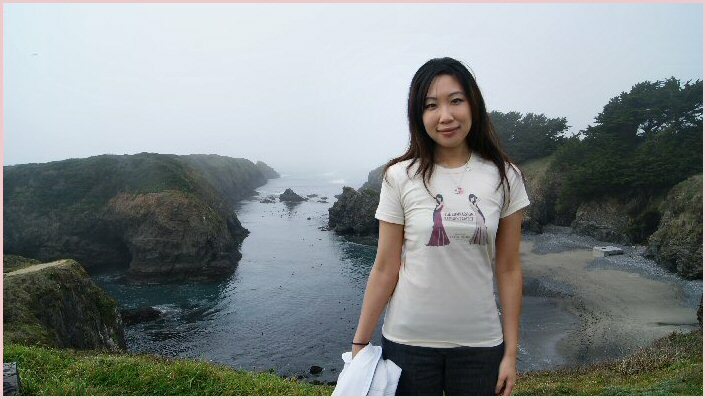 Hubby and I went roadtripping to Mendocino this weekend. 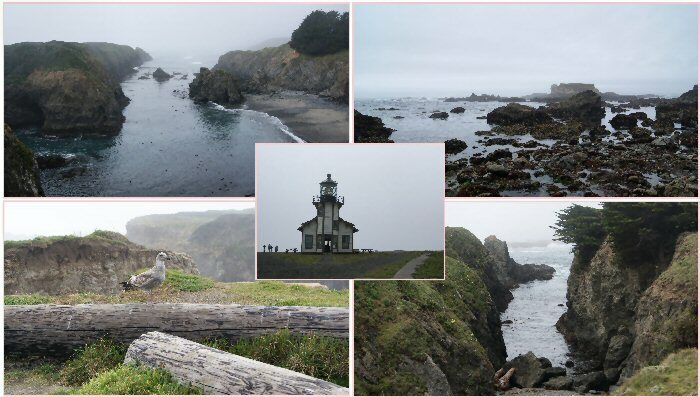 Mendocino is an ideal setting for a short story! I love it there! On the day we drove the coastline, however, it was foggy. The bad: It was foggy. The good: The mood set by the fog inspired me to write a short story! That’s definitely new. Fiction I have written so far have all been set in the New England region of the States. 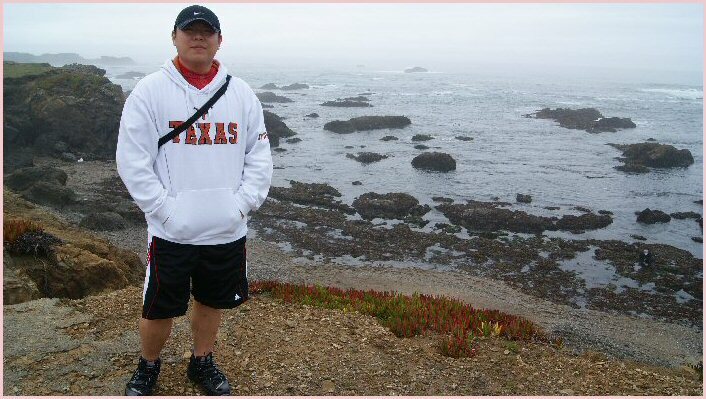 To write or to even think of writing about NorCal is different for me. 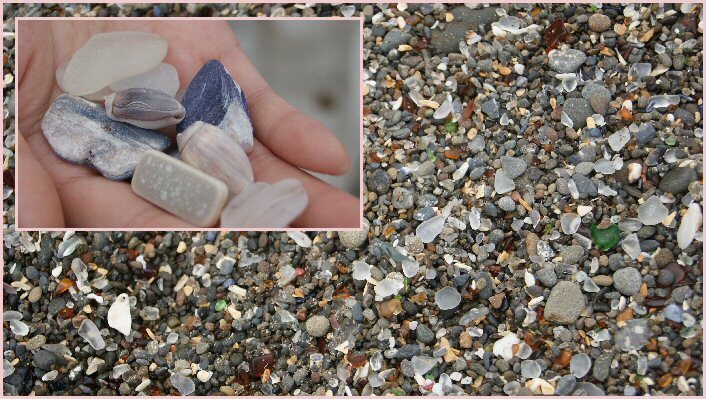 The above photos are of Glass Beach in Fort Bragg. The site used to be a dump where locals threw their trash: glass bottles, appliances, all sorts of junk and litter. Over the course of 50 years, the pounding waves of the Pacific wore away the glass, metals, and plastic into smooth pebble-like pieces. Really, really pretty! Also, since it was a looooooong drive, I got some reading done in the car. 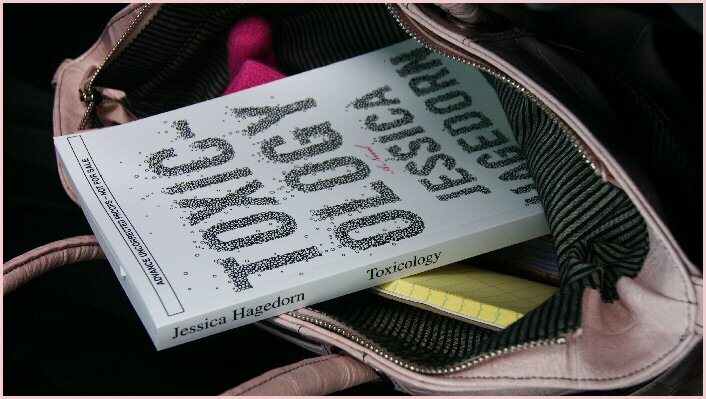 Kartika Review editors were given advance review copies (ARCs) of Hagedorn’s latest novel, Toxicology, a book I can best describe based on my superficial preliminary reading of it as very pomo. I know some folks shudder at being categorized as pomo lit (in particular the folks who write pomo lit), but I mean c’mon, the novel was a pastiche of pop culture references rendered into a nonlinear narrative with a lot of irony, self-deprecation, and dark humor. Gee, what’s the sum of these parts? Toxicology is as postmodern-lit as postmodern-lit gets these days. In the case of this particular book, that is all a very good thing. I enjoy Hagedorn’s writing immensely! Count me one of her biggest fans. Again, though, I read it very fast in the car on a roadtrip, and will be giving the novel a second, closer reading. What I have to say about it may change after that. Readers who enjoy David Foster Wallace, Chuck Palahniuk, or Don Delillo will probably like Toxicology a lot. The book is out this month (April 2011), so go out and get it! 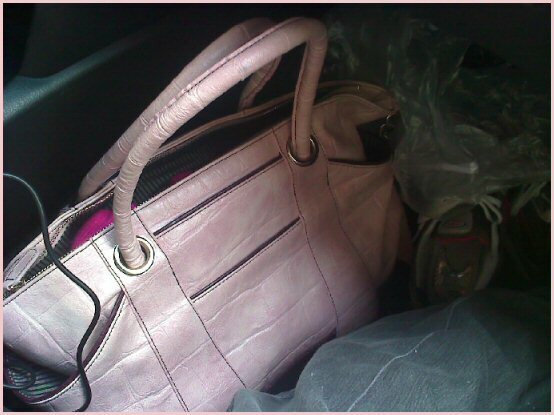 And yes, that’s one of the first prototypes of the Peripatetic weekender tote in pink that I carried all weekend. The above photo is a camera-phone pic of it in the car. 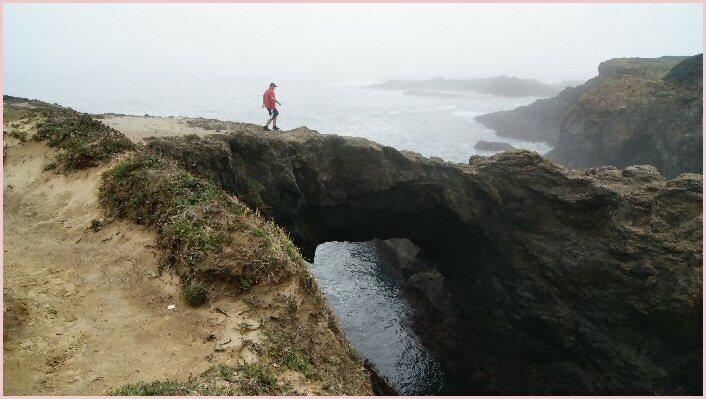 Over my objections against him doing what he’s doing in the above photo, Hubby crossed that narrow bridge-cliff-thing. Not. Cool. I was on the verge of a panic attack the whole time I watched him cross it. In addition to the cool Compassion Fashion Project tee, made with eco-friendly, sustainable organic cotton (and carrying my very own Taryn Zhang Peripatetic tote, which of course is not pictured because that would make too much sense, you know, to remember to advertise my own bags), I’m wearing an adorable necklace designed by Eki Mura, the jewelry designer behind EkiLove. Eki is multi-talented and wears many hats. In addition to accessories design (including handbags!) she’s a makeup guru, artist, and–well, okay, mind as well put it out there–as Hubby might remark, a “hot chic.” There’s just no avoiding it, which is that this designer happens to be very, very, incredibly beautiful. The design point of view of EkiLove may best be described as pink pearly girly pretty princess cuteness (try saying that a hundred times as fast as you can), and is a wildly popular style in Asia that is just beginnning to gain attention here in the States. It’s derived from Japan’s harajuku fashions, and this particular style is referred to as the hime or “princess” style. I certainly could never pull off the hime style, but one necklace here or two is fine. 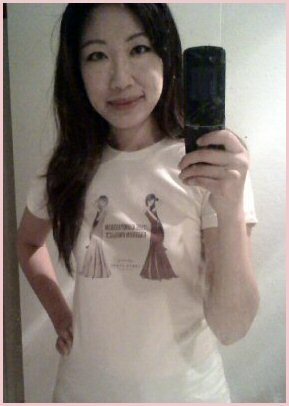 =) Especially if it’s by someone as sweet, gracious, and talented as Eki Mura! Anyway. Check out her stuff. Right now, a significant portion of all EkiLove’s proceeds will go to support earthquake and tsunami relief efforts in Japan. This entry was posted in Friends in the Trade, Musings, Personal, Unrelated, Vacation Pics. Bookmark the permalink. You write short stories too?! Oh my goodness, I think the question to ask is what can’t you do? You are so talented! I’m loving the featured color of your bag, such a soft baby pink color and how fitting that you are also wearing girly jewelry from eki! Never heard of her but will check out her stuff. I’ve noticed most artsy types are like this– a jack of all arts. =) Another fellow style blogger, Joey, referred me to EkiLove. Love her jewelry design! It works with both formal and casual outfits, elegant and laid-back. Lately I’ve been wearing my Eki necklace a LOT actually. Oooh, that cliff-bridge thing that was giving you panic attacks looks like fun! I would totally want to go across it! Also, love the baby pink of your prototype tote. It’s so great that you made your dream come true designing handbags. We kind of have similar backgrounds… I’m graduating from law school in May and will start articling this summer. But all I want to do is design clothes! That place is amazing! You’re right, fog makes travel difficult but the mood it set, WOW! 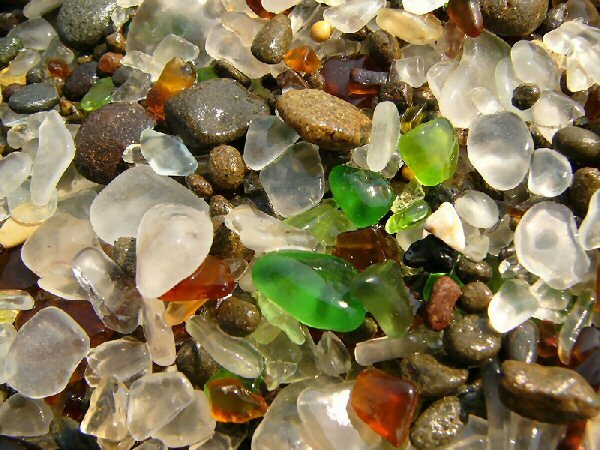 And the glass beach, I’ve never heard of it. It’s crazy what nature & man can create. Oh Eki’s stuff is so great. I recently purchased a necklace from her though she sells out so quickly!! You’re an adventurous one I see! That’s awesome. I’m not too familiar with the process in Canada for becoming a legal professional. Do you have to take something similar to a bar exam after graduation? By articling, what is that? Do you mean serving as an editor on Law Review? I’m intrigued! We should chat! Thanks! I’m definitely looking forward to reading more of your blog. What a great find it was! Her stuff is adorable, and really targets the aesthetics of most young women, esp. the ultra-feminine ones. So I’m not surprised at all that she sells out fast! She is! She does, like, everything, from being a popular makeup guru to designing really adorable fashion accessories! In BC (where I’m from), in order to be admitted to the Law Society you have to work as an articling student for a year before you can write the Bar Exam. Basically, like a lawyer in training type thing where you are supposed to get all the practical experience before you can actually practice on your own. We should definitely chat!! Oof I haven’t heard the word “pomo” since my days as an English lit undergrad, and judging from your description of that book, it seems very paint-by-numbers pomo. Pomo by numbers! Glass Beach sounds like a very pretty place. If it were me I’d be tempted to fill my pockets with pretty glass pieces! Did you? Yay for ekiLove’s necklace. It’s really pretty, right? wow mendocino is gorgeous! absolutely breathtaking. what a perfect place to visit with a significant other! Really pretty!! hope you had fun!! I love everything about your trip. It makes me miss Nor Cal so bad. Now what’s up with TZ? I haven’t heard from you in awhile! I really enjoyed this update.. very interesting pics too. I adore collecting small, smooth colorful rocks for my potted plants. LOOKING GOOD LADY! Love the shirt!! hey sunny… i really love and enjoy this post. that plase must be fabulous.. i really wanna go there.. the scenery is just beautiful. 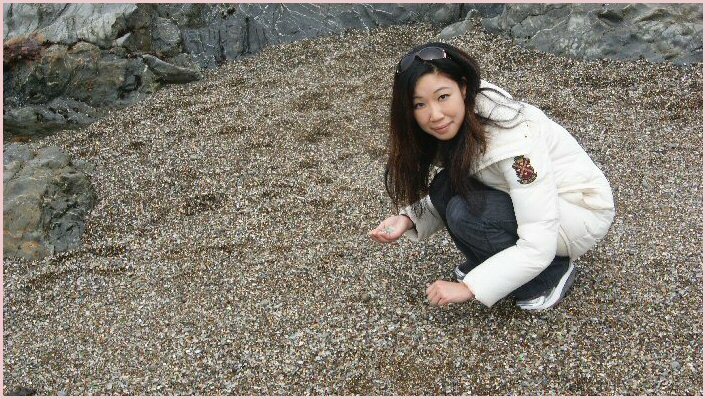 especially the glass beach, they’re really beautiful..